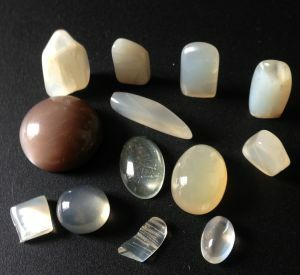 Moonstone, a variety of orthoclase feldspar. It is almost perfectly transparent with a white shimmer and a bluish, milky light which is reminiscent of moonlight. Moonstone sas healing affinity with stomach, spleen, pancreas, pituitary gland, unblocks lymphatic system, relieves anxiety and stress, aids birthing process, helps female problems, emotional balancer, helps lessen tendency to over-react emotionally, enhances flexibility in attitudes, aligns emotions with Higher Self.Like chrysocolla this is a very feminine stone, bringing ease to period pains and kindred disorders but on a much more fruitful scale with its emphasis on fertility and child bearing.A good emotional balancer it has been described as the mother earth stone, a good solid friend inspiring flexibility, nurturing and wisdom, whilst keeping the emotions in balance. Moonstone is the Mystical Birthstone and the Modern Birthstone of Cancer. It is the Ayurvedic Birthstone of Libra and it has also been linked to the star sign Pisces. The famous mineralogist George Frederick Kunz in his 20th century book 'The Curious Lore of Precious Stones' associated it with the Moon. Moonstone is said to activate Anahata, the Heart Chakra ( 4 ).